Recording video has changed dramatically over the past couple of years and consumers have moved from bulky camcorders to phones more often than naught. The amazing thing about new smartphones is the quality of the video they can record and the ease in which you can share that video. 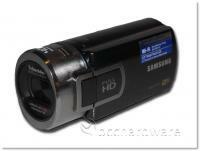 Samsung has some great phones that do amazing things, and yet the realize that there is still a market for dedicated camcorders - if you do it right. 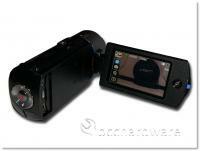 How do you do a camcorder right these days? You either have to have some insane quality that you can't get in a smaller device, or you have to offer great functionality and convenience. 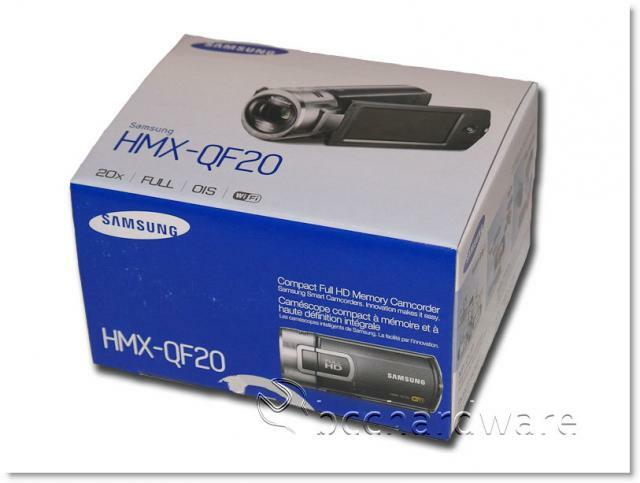 Samsung HMX-QF20 tries to capitalize on quality, performance, convenience and features - all with an attractive price tag. They do this by using flash storage for your video (SD, SDHC or SDXC) and putting WiFi in the camera for backup, sharing and viewing convenience. There is a lot of little things in this camera that might go unnoticed and we're going to take a look at them and see if they are worth carrying around another device to record video. Samsung asked us if we could do a couple more reviews here before the summer kicked into high gear, so I figured a camera and a video camera would be relevant items for your summer travels. 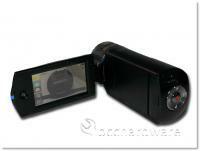 We recently looked at the NX200 ILC camera, so that leaves us with the HMX-QF20. I haven't been shopping for a camcorder so when this unit arrived I was surprised to see how small and compact HD camcorders have gotten. The HMX-QF20 is very small and can actually slip into a case for a Nintendo DS. Although it has a compact size, the button layout is pretty much non-existent in a lot of ways and this makes it work well - even in large hands. 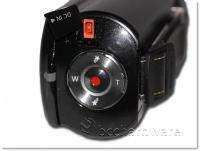 The layout is clean and simple and the sides of the camera are free of buttons. The only functionality on the sides (when closed) is the screen on the left side. The hand strap slips tight for storage and is actually very convenient so you don't snag it on other items in your camera bag. As you can see below, the camera functions equally well left-handed or right-handed and auto-rotates the video (most of the time). We'll get more into that during testing. 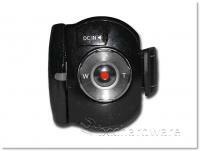 One of the main features of the camera is the touch-screen that is used instead of a plethora of buttons and obscure functions along the side of the camera. One thing I like is that the screen even offers a zoom function so you don't have to touch the controls at the rear of the camera if this is more convenient. The rear of the camera is where all the controls are located. 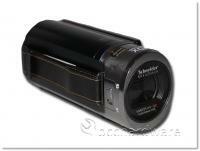 They offer basic zoom functions, bookmarks as well as record/snap photo. 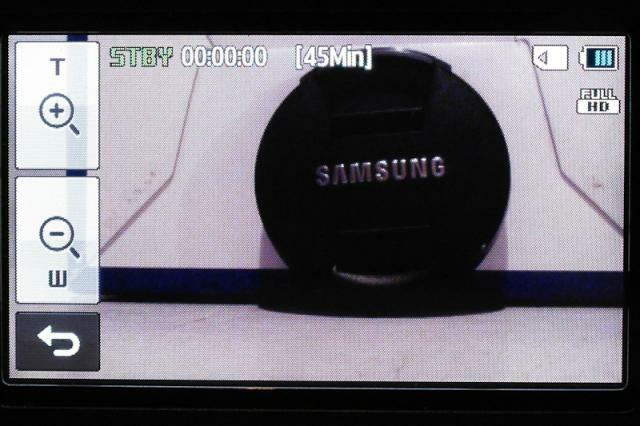 Also at the rear of the camera is the power jack used for charging the battery. 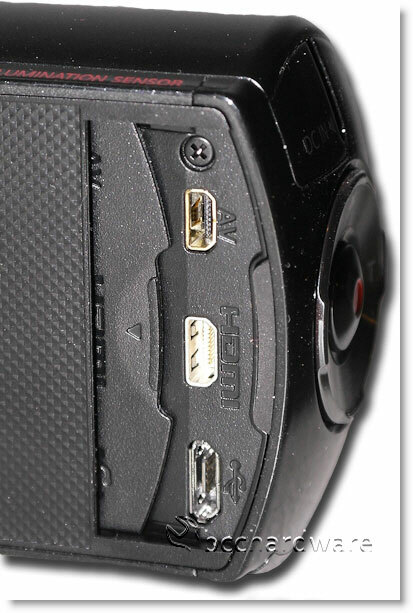 When the LCD is swung out it reveals a sliding door on the camera that hides a micro-USB connector, a micro-HDMI connector as well as another connector for hooking up AV cables to the camcorder. On the screen that swings out we have a single "home" button that gets you though some of the menu navigation. With a camera of this size and price, the bundle is a little lean, but at least we have a pretty snappy f1.8~f3.9 lens that should provide us with pretty decent light gathering ability - even when racked out to 20x optical zoom.